“Did you read Calvin Trillin’s story in the New Yorker about those chowhounds chasing after a Szechuan chef?” wondered several of my well-read friends. That spicy talker ran this month, chronicling the appearance — and inevitable disappearance — of an elusive Chinese cook named Peter Chang, whose fans have been trailing him from state to state, strip mall to strip mall, unearthing his Szechuan delights at restaurants with names like China Star and Szechuan Boy. Yeah, I read it. But I didn’t have to. I’m living it — on a smaller geographic scale. I first tasted chef Cheng Biao Yang’s cumin lamb and incendiary chong qing hot chicken in 2001, when he was selling Szechuan food out of a Greenwood storefront called Seven Stars Pepper. Not long after, the Szechuan chef — who practiced his craft in Beijing and Shanghai before moving to the U.S. — took his restaurant’s name and moved to 12th and Jackson. I found him there in 2003, hiding in plain sight on the second story of the Ding How Shopping Center, working with his wife — the restaurant’s ever-enthusiastic hostess Hoang Ngo. Ensconced in the heart of Little Saigon, they were running a shop built with equal parts spice and nice, offering an expansive Szechuan menu that had tongues tingling and palates piqued — one that knocked me firmly out of my Cantonese-food induced coma. Chong qing hot chicken: you never know where it’s going to turn up. Three years later word came down that Seven Stars Pepper’s Szechuan chef sold the name, and the place, and moved once more. 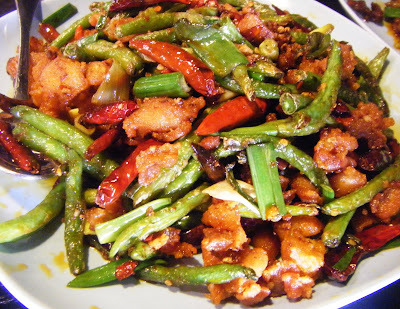 This time to an even larger and fussier-looking venue in Bellevue dubbed Szechuan Chef. Soon enough, the place was drawing raves for its Szechuan-style crab and hand-shaven dan dan noodles, as well as its kung pao kidneys, wild chili pork with tripe, and intestines and fish in hot spicy gravy. [Kevin P. Casey for Seattle Times]. Last summer it was deja vu all over again. This time the name remained, but the Szechuan chef had left the building. Overworked, exhausted, tired of keeping up with an over-sized restaurant, he and his wife sold their place, bailed on Bellevue, took a much-needed vacation to Sichuan province and disappeared from my chilies-fueled GPS. Gone again: just like Trillin’s peripatetic Szechuan chef Peter Chang. 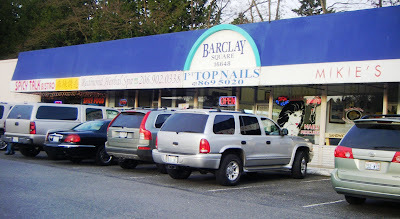 But early this year Cheng Biao Yang and his wife reappeared, quietly opening Spicy Talk Bistro at 16650 Redmond Way, in a Redmond strip-mall adjacent to Frankie’s Pizza & Pasta. There, in addition to many of his signature dishes (plus a handful of Cantonese classics) he was serving — gulp! — sushi. That foray into exotic waters didn’t last long, Hoang later explained, all but slapping herself upside her head for their momentary lapse of judgment. A month in, it was out with the new (86 sushi!) and in with the old — favorites, that is, albeit on a somewhat truncated menu offered every day but Tuesday. Two weeks ago, I got news of their whereabouts. And last week I high-tailed it to Redmond, where I treated myself to food every bit as good as I remember. That’s Spicy Talk Bistro, on the far left. For now, Spicy Talk is flying under the chowhounders radar, but once word gets out about this charming little bistro (hello, Microsofties! ), fans of chef Yang will be headed in his direction, their lips burning in anticipation. They’re talking spicy. 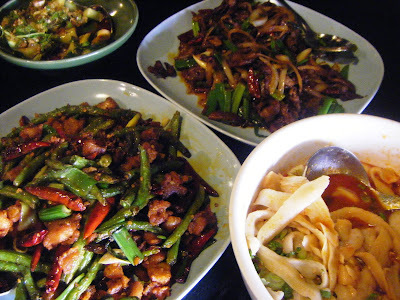 Clockwise, from bottom left, chong qing hot chicken, cucumbers with hot sauce, cumin lamb, dan dan hand-shaven noodles. After a trip to the site of the former Mysore Indian restaurant, now comfortably and prettily appointed as Spicy Talk Bistro, chances are you’ll be praying that this time the Szechuan chef and his wife stay put. Not me. I’m hoping they make another move, and soon. Preferably to my neighborhood. 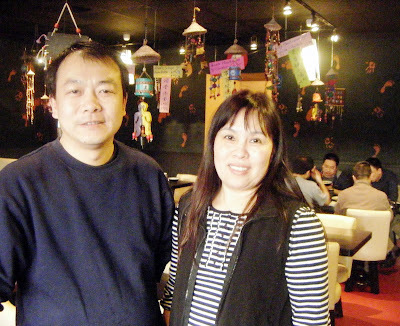 Chef Cheng Biao Yang and his wife, Hoang Ngo at Redmond’s new Spicy Talk Bistro.